This is one of Oahu’s most beautiful beaches with excellent swimming and wind surfing. 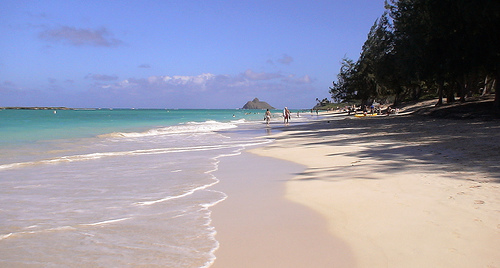 Kailua beach has fine sand – perfect for sunbathing and recreational activities. This area is also a world-class wind surfing destination. Several offshore islands create a beautiful backdrop to this tropical destination. 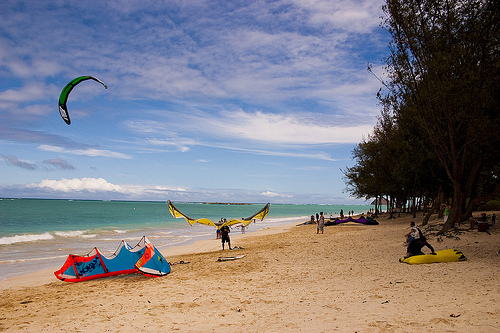 Located in the town of Kailua, this beach is famous for its wind surfing. There is even an offshore island that you can swim too if you feel adventurous. The sand is wide and the waves are decent. There are some large grassy fields for other activities. To access this beach you have to drive all the way through the town of Kialua but it is definitely worth it. 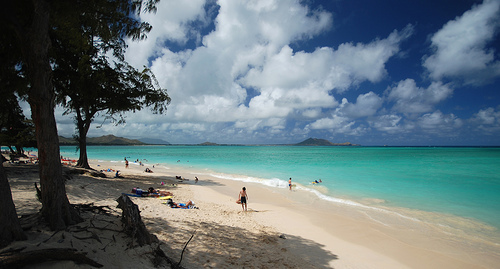 This beach is just north of Lanikai beach by 2 miles and has more to offer. Kailua Beach OCEAN INFORMATION — For a detailed description of the Pacific Ocean’s marine climate, water properties, currents, tides, waves, etc., please visit The Ocean Atlas of Hawaii online. You’ll learn many interesting facts, like our average surface water temperature in Winter is 75 F (24 C) and 81 F (27 C)in the Summer.Call 596-SURF (that’s 596-7873) to hear a recorded message on conditions at various O`ahu beaches. The recording is a free service of the Surf News Network (SNN) and is updated four times a day, 365 days a year, at 7 a.m., noon, 3 p.m. and 7 p.m. In addition to wave heights, SNN provides information on winds, tides, and buoy readings.